Today I am happy to announce the public preview of email subscriptions for report pages. This new feature for Pro users allows you to quickly subscribe to emails of the report pages that matter most to you. 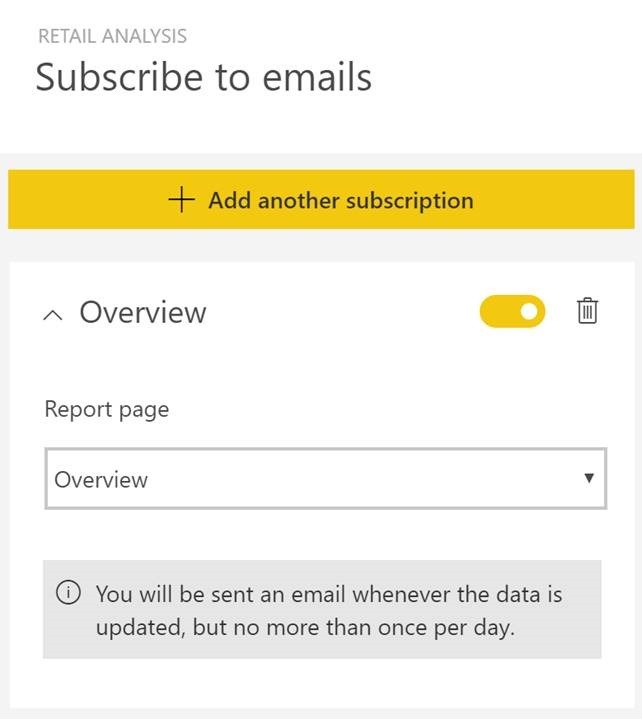 Once you’re subscribed, Power BI will regularly send screenshots of that report page directly to your inbox whenever the data changes. 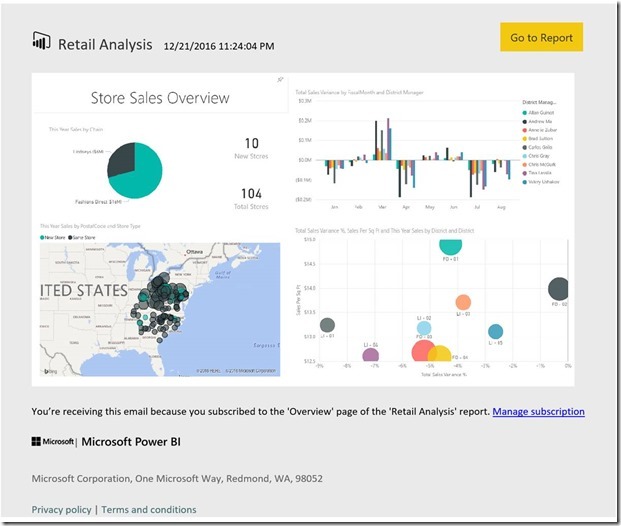 The image in your inbox will show up exactly as it does in Power BI, and include a link to the report where you can drill into any interesting findings. Thanks to email subscriptions, it’s never been so easy to stay up-to-date about the data that matter most. Intrigued? Read on for more details. Or, head directly to your favorite report and start setting up a subscription of your own. Have feedback? We’d love to hear it. Go to the community forums and make your voice heard! In the subscriptions pane that appears, select the report page that you want to subscribe to. Notice you can subscribe to multiple report pages. For most subscriptions, you will receive the email once every day. However, data refresh settings can impact frequency. For full details, see the documentation. Once you’re satisfied with the subscription, select “Save and close” at the bottom the subscriptions pane to confirm the subscription. That's it! 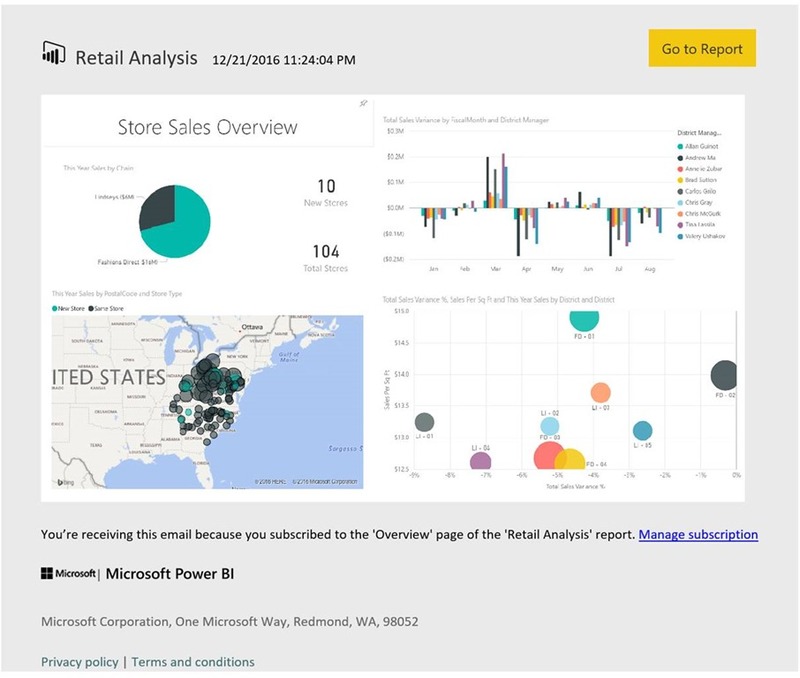 The next time the data is refreshed, Power BI will send an email to the address that you use to sign into Power BI. See a sample below. Tip: Want to see the email right away? Trigger a refresh by going to the dataset, and then click the “Refresh now” option. If you don’t have edit permissions to the dataset, you may have to ask someone who has those permissions to do this for you. 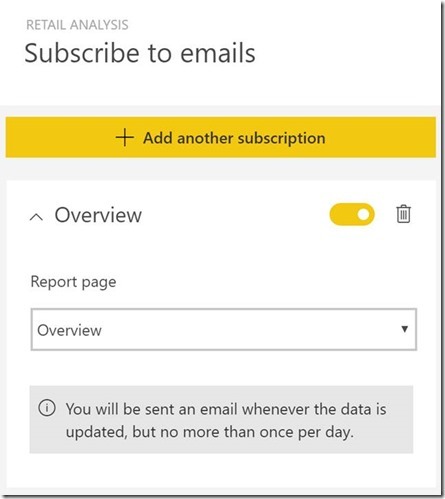 This is just the first step for email subscriptions in Power BI. In the coming year, we will be adding even more functionality to the this feature, including the ability to subscribe others to emails. Stay tuned to the Power BI blog for more details!